The latest plan to ease congestion on Britain's blocked roads targets the people who dig up our streets again and again. But why are there now so many road works and can they suddenly be cut back? Remember the Cones Hotline, John Major's headline-grabbing wheeze to cut traffic jams? Motorists, frustrated at seeing tracts of tarmac coned off and not a workman in view were urged to report such matters over the phone. The scheme was quietly dropped after it failed to make much of an impact (to the disappointment of all those pranksters who called to request "two 99s and a Cornetto"). Undeterred, it seems transport chiefs are again targeting the humble traffic cone in a bid to cut congestion. 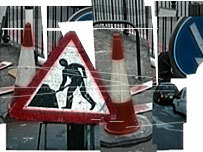 On Wednesday the government is expected to outline plans to crack down on unnecessary and prolonged road works. The country's urban road network has become a quagmire of street excavations and sluggish tailbacks. Drivers, traders, even pedestrians, fume at the seemingly relentless disruption. 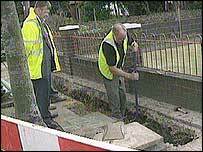 The AA estimates there are four million "dug" holes in Britain's roads at any one time. "It seemed like every five minutes there was another company digging up the road," says Philomena Card, of the works on Camden High Street in London, where she sells T-shirts. Workmen excavated the road, a major thoroughfare in the north of the capital, 144 times in one year. Glasgow's Great Western Road was excavated 223 times in 12 months. Before the early 1990s, only a dozen or so companies had statutory rights to take a pneumatic drill to a public highway. This grew to about 150 following the deregulation of telecoms and other utilities and the advent of cable TV, all of which have a stake in the wires and pipes that run underground. Coupled with this, utilities historically don't have to apply to town halls for the right to start digging. They simply give notice. Initially, there was much forward planning, as the telecoms firms embarked on big jobs such as laying trunk lines. "Today it's more bitty: the 'as and when' individual connections leading off from the trunk line," says Bob Coe, of the Central London Partnership, which promotes the capital. Frequently, road works spring up with hardly any notice or thought for how they will affect the public. Councils, which are in charge of all but the most major roads, are often themselves to blame, excavating to lay cables for traffic lights or simply road resurfacing. Recent efforts to bring order to the problem have had limited success. Town halls were given the right to bill companies which overrun on their estimate for getting a job done. But this has led the utilities to deliberately overestimate the time needed for repairs, by 30 to 50 percent according to a recent report by Halcrow. The latest plan to win back the votes of irate motorists is to charge those digging up the road. A bill expected to be announced in Parliament on Wednesday could outline a plan for "lane rental", which already operates on trunk roads and motorways. Under the scheme, utilities would lose their automatic right to dig where and when they want. Instead, they would have to apply for a permit to excavate and pay several hundred pounds a day to do so, thereby providing an incentive to get the job done as quickly as possible. There is also talk of "traffic czars" who would be responsible for running these programmes. The RAC Foundation backs the plans. "The power has overwhelmingly been in the hands of the utility companies. Local authorities need to get tough by charging utilities," says the foundation's Jonathan Simpson. But it's too early to sit back and think of the open road just yet. Trials of the lane rental scheme - one in London, one in Middlesbrough - have made little impact, according to recent research commissioned by the government. A major hurdle is that all utilities, apart from telecoms, are allowed to pass on these extra costs to their customers. All these efforts will mean nothing without cash to ensure they can be effectively run, says Mr Coe. "Fining a utility company which overruns on its work is a good idea, but you need to have people out there enforcing it." 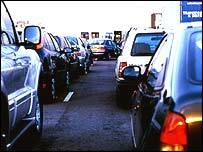 The appeal to ministers of cracking congestion with one big idea, such as this, is all too obvious. But like the Cones Hotline before it, the risk is that it will end up buried in a hole in the road. Many years ago Milton Street in Maidstone was constantly being dug up. Eventually the road was completely closed and resurfaced, much to the relief of all of us who lived round there. The day after the newly resurfaced road was re-opened, someone was there digging a hole in it again! We just wished that whoever was responsible could have planned it a bit better. If you want to see miles of cones and no work being done, look at the M6 Northbound three miles prior to Junction 3a to Junction 4 - no work has been done for the last eight weeks except for it being used as a speed toll area. It seems we want it all ways: new utilities, cheap services, tidy new surfaces on roads and pavements, but none of the pain involved in providing this. Fittingly, in Holland a system similar to the Heineken ads exists. All companies have acces to a central database which tell them which cables (even from other companies) are lying where and most importantly any future work involving digging up the road. They then can co-ordinate amongst themselves to share trenches and minimise costs and times of disruption. Wokingham District council has given up patching country roads and instead closes them entirely for a week or two to strip and relay the whole job lot. I say it works brilliantly but then again I cycle to work. For once, perhaps the railways do it better than the roads. In order to undertake work on the railway line itself, you must book a "possession". This is the right to close a piece of railway line at a certain time for a certain period in order to carry out work. Possessions are managed by Network Rail and Rules of the Route dictate when access is allowed. There is an incentive not to overrun in the form of very steep penalty clauses, which are paid in the form of compensation to the train operators. This method of working has been going on for years and works well.